THE GOOD LIFE WITH SWERY! THE GOOD APPAREL WITH A SMILE! This has been a crazy week here at Mega64! Recently, we had a run in with our pal Swery- he developed some of our favorite bizarre Japanese games like Deadly Premonition and D4. We even did an episode of Marcus' Corner with him a couple years back. He hit us up when he started putting together his next game, "The Good Life." He let us play it and showed us how excited he was about it, but he needed help in getting it funded. We knew we had to get involved and help. We decided to do something a little different and instead of doing one big video, we did 3 reeally weird little micro-videos. It ended up being really fun to cut loose and get a little avant garde in that "Swery" style. Check 'em out if you haven't already and congrats to Swery on getting his game funded! Tomorrow, we'll be adding a shortened "Friendimension" video with some highlights of us playing an early "The Good Life" build, along with a level nobody else has seen before! We also wanted to tell you that this Friday, May 4 at 10:30AM Pacific, we'll be releasing a couple new merch items online... some of our most stylish ever! The Zone 64 Shirt and the Mega64 Beanie will be released in limited quantities! These items will go fast, so jump on 'em when they show up! And to those of you who preordered some other items from us... you'll be getting yours very soon! 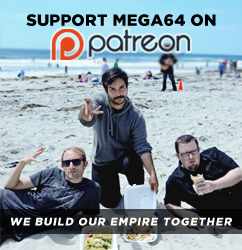 Come see us again this Sunday for a Mega64 Podcast Live! And more fun stuff to come!